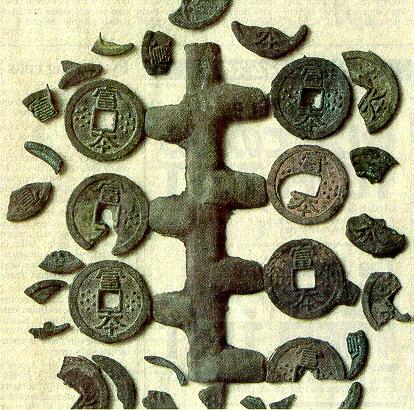 Japan's money economy began earlier than textbooks have described, archaeologists said Tuesday in unveiling 33 bronze coins from the late seventh century recently unearthed in the village of Asuka, Nara Prefecture. According to the Nara National Research Institute of Cultural Properties, the coins, discovered last August at the Asukaike Ruins in Asuka, are older than the Wado Kaichin coins first minted in 708, thus bumping them from the archaeological record books as the nation's first circulated money. The bronze coins, whose existence has been known for some time, are called Fuhonsen, the name of a charm believed used during the Nara Period (710-784). The time at which Fuhonsen coins were minted falls into the Fujiwarakyo Period (694-710), which is based in modern-day Kashihara, Nara Prefecture, where three sovereigns -- Empress Jito Emperor Monmu and Empress Genmei -- once held court. The research institute said the latest findings prove that Fujiwarakyo was aimed at creating a polity with solid political and economical structures based on the Taiho Code (Taiho Ritsuryo) of 701. The code consisted of six volumes of penal law (ritsu) and 11 volumes of administrative law (ryo), modeled after the legal code of China's Tang Dynasty (618-907). The researchers said the coins may have been cast under the order of Emperor Tenmu, husband of Empress Jito. "The coins perhaps did not function well as a monetary unit because the distribution system (in Fujiwarakyo) had not been developed," said Jun Ishikawa, chief researcher at the Toyo Research Institute of Mint Coins. According to the Nara institute, six of the 33 coins were unearthed intact, while others were found in pieces. The six intact coins were attached to a bronze lattice, showing that they were minted at the site and had not yet been circulated, it said. Each coin is round and measures about 2.5 cm in diameter, with a 6-7 mm square hole in the center - about the same size as a Wado Kaichin. The front carries two vertically aligned kanji characters - "fu" for "wealth" and "hon" for "basis" - flanked by a group of seven dots on each side. The national institute's Hiroyuki Kaneko said the design is similar to China's Yosho coins, which were also used as charms. He said those who were involved in minting the coins may have modeled them after Chinese coins that were available from Silla, one of the three ancient Korean kingdoms. Prior to the discovery at the Asukaike Ruins, five Fuhonsen coins were found in 1985 at a dig on the former site of Heijokyo in today's Nara city, which served as the nation's capital during the Nara Period. The Nihon Shoki, the oldest official history of Japan, printed in 720, states that "bronze coins were issued for the first time" in 708. But the Japanese chronicle also suggested that bronze coins existed in the late seventh century, and this had left archaeologists perplexed. During the Edo Period (1603-1867), Fuhonsen coins were considered play money, and similar coins were made for charms, experts said. Before the origin of the country's monetary system is rewritten in the history texts, pundits said certain facts must be clarified, including the specific time when Fuhonsen coins were minted and whether they were circulated as money. The Asukaike Ruins are believed to be a former site for "a national production center" where products related to the Fujiwarakyo court were manufactured under the latest technologies between the late seventh century and the early eighth century. The ruins are located near Asuka Temple, Japan's first large-scale Buddhist structure, which belonged to the Soga family, a powerful clan in the region until the mid-seventh century.